Since 1921 Canton City Blue Print, Inc. has been serving engineers, architects and surveyors throughout Ohio, Pennsylvania and West Virginia. Our business began as City Blue Print Service in an upper floor of the First National Bank Building in Canton, Ohio. The business was operated in conjunction with a local surveyor's office and serviced only reproduction requirements in the immediate downtown area. By the 1930's, the business was moved to Fourth Street where the operation was expanded to include supplies for engineers, architects and surveyors. January 1956 incorporation papers were filed with the State of Ohio and our name was changed to Canton City Blue Print, Inc Our continued growth necessitated our move in 1970 to our present 13,000 square foot facility at 1334 Oxford Avenue. Canton City Blue Print, Inc. continues to address our changing technology and the needs of our customers. This is achieved by incorporating state of the art reproduction services, and a supply line to compliment the industry. Our commitment to customer service is as strong today as in 1921. We are proud of our long term tenure of business history. 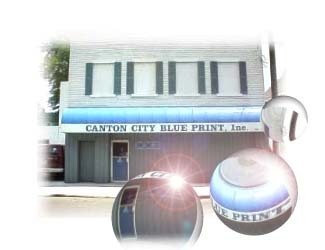 Our commitment to you is that we will continue to provide the quality service, technology and product you have come to identify with Canton City Blue Print, Inc.